We sat patiently, waiting for the sun to come up. Of course, we knew it was a fruitless exercise, the sun hadn’t come up for a very long time now. Grandfather so enjoyed the opportunity to reminisce with his stories of the well-gone age. Hydro-powered halogen heating and artificial light systems had been in operation since the final warming notice. Like many things the presage had become so frequent, it became almost too commonplace. Reduce carbon emissions; cut down on all uses of fuel, even the food wastage situation seems a bit crazy now, particularly as the nourishment issue is taken care of by the simple process of swallowing a pill. The question as to why the ‘Unbrand’ regime was not put into practice a lot earlier before the great shut off, is perhaps a quandary for the new ‘Unique Diversity’ students. We are just very lucky that someone somewhere had the forethought to put all of the mechanisms in place ready for the, then, inevitable global mourning. If it wasn’t for Grandfather telling the children about the bygone age of mail being sent via wireless and two cars being owned by each household we really would not be any wiser as to the massive footprint of error that has been left behind. There are discussions amongst the ‘Phrasesoft’ group, they are hoping for funding; this will help towards the great ‘Crowd Print Project’, some works of literature transferred from chip to page. This is a great time of reflective change. I’ve just walked through the kitchen and taken-in an aroma that immediately transported me back in time. Bizarrely as my mind focussed in and out of various scenes from the past my subconscious highlighted a forgotten idea. When detecting an odour, the olfactory nerve receives a message, an impulse then transmits to the brain. From the olfactory bulb, which processes the signal, it then sends information to other connectors, this is the limbic system. The limbic system plays a key role in governing, memory, behaviour, mood, and emotion. Some people with the full olfactory function may be able to conjure-up recollections when a particular smell triggers this certain part of the brain. The perfume trade is built around smell, it is extremely emotive. Marketing of scent presents an enormous selection of perceived emotions and feelings; from relaxation, desire, power, and liveliness; all transpiring from an aroma. A person may find a certain variety ‘powerful’ or calming, with another relating to it as, ‘nauseating’. Regardless of this, though, there are certain smells that all humans find unacceptable. The smell of smoke, or of rotten food. This is an inbuilt survival mechanism that warns us of potential risk. No doubt we all have a fragrance, good or bad, that reminds us of certain people, things, and happenings in our lives. We use perfumes, maybe, to cloud psychological issues; I know for a fact that fragrances are used to mask certain smells around the home. So, all that said I suppose I shouldn’t be all that surprised when the smell emanating from my kitchen is going to result in me searching, for days, maybe weeks, through boxes, files, and memory sticks until I come across the life-changing idea that has been dormant for so long. I have spent the last couple of weeks, literally, (forgive the pun) trawling magazines and the internet, basically to see what all the fuss is about. I don’t have a twitter or a face and have relied on my instincts for over half a century. It seems that with age we can become a bit slower or maybe less motivated to take hold of new life-demands. The bombardment of, how to, and quick fix articles became quite overwhelming. I hadn’t realised my life was lacking so much. Up and until now it hadn’t actually occurred to me that, perhaps, I had been completely misguided in my approach to life. I get all the hype-stuff and the need to have a presence, of course and this is all ok as long as you are in control. That’s it, I need a brand. A few years back I looked into the possibilities of using Facebook for a business promotion. Great, got the concept, understood the reach, then came the disruption. Who are all of these photographs and messages from? Within a couple of days of having set-up the page it was just a chaotic brawl of attention seeking trivia. The opening times of the business just faded into insignificance. Now, there is no judgment of how other people choose to lead their lives; after all I’m one of the lucky ones. A number of years ago I decided to use a pen-name, (or two) this enables me to lead a completely anonymous existence. Of course, this is when it dawned on me that I had been enjoying these benefits without actually realising that what I had is in fact a brand. An old-fashioned version, but a brand all the same. All my hopes and dreams have finally come to fruition, I am at last ahead of the game. My stepping, all be it, gingerly into the simulated, virtual reality of the 21st Century Internet World is happening right now. I am so pleased that you have been here to join me in this life changing revelation. I hope you’ll find the time to look us up occasionally, just to see how we’re getting on. Go team Toby. So here we have the final blog of 2017. Polly has just released her ‘Polly Put the Kettle On’ stress free family menu-card book. Available free now on Amazon-prime. Her next book will be Home Bistro to be released Summer of 2018. 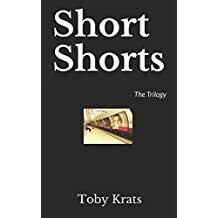 Order, Short Shorts by Toby Krats on Amazon now.